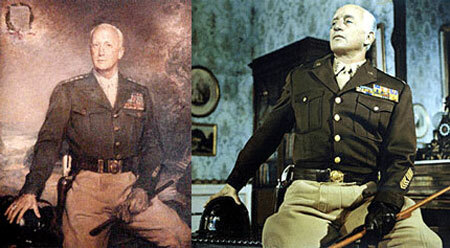 Near the end of the 1970 bio-pic Patton, released in the U.S. 40 years ago today, the larger-than-life title character, Gen. George S. Patton, Jr., is shown having his likeness captured on canvas. The painting session is interrupted when the volatile old cavalryman has a heated phone call with a superior where he loudly declares that the large American troop presence in Germany should be used to take on their next military adversary, the Russians. Flabbergasted, the higher-ranking general on the other end of the line slams down the receiver exclaiming, “You’re mad!” Patton sends the artist away declaring that no one will be interested in a portrait of a madman. I’ve often thought that the filmmakers staged this scene as a subtle commentary on their own approach in bringing Patton’s story to the big screen.